Fair-skinned people who are prone to sunburn may need to take supplements to ensure they get enough vitamin D, say experts. It appears that those with pale skin, while not deficient, may still be lacking in the essential vitamin that the body makes from sunlight. The Cancer Research UK-funded team say that even with a lot of sun exposure, those with fair skin may not be able to make enough vitamin D.
And too much sun causes skin cancer. Clearly, for this reason, increasing sun exposure is not the way to achieve higher vitamin D levels in the fair-skinned population, say the researchers. But taking supplements could be. Their work examined 1,200 people. Of these, 730 were found to have "lower than optimal" vitamin D levels - and many of these were people with very pale, freckled skin. Vitamin D is important for healthy bones and teeth. A level less than 25nmol/L in the blood is a deficiency, but experts increasingly believe that lower than 60nmol/L are suboptimal and can also be damaging to health. Most people get enough vitamin D with short exposures to the sun (10 to 15 minutes a day). A small amount also comes from the diet in foods like oily fish and dairy products. But people with fair skin do not seem to be able to get enough, according to Prof Julia Newton-Bishop and her team at the University of Leeds. Part of the reason might be that people who burn easily are more likely to cover up and avoid the sun. But some fair-skinned individuals also appear to be less able to make and process vitamin D in the body, regardless of how long they sit in the sun for. Prof Newton-Bishop said: "It's very difficult to give easy advice that everyone can follow. There's no one-size-fits-all. "However, fair-skinned individuals who burn easily are not able to make enough vitamin D from sunlight and so may need to take vitamin D supplements." 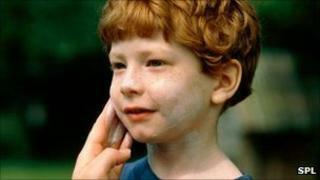 Hazel Nunn, of Cancer Research UK, said: "It is about striking a balance between the benefits and harms of sun exposure. "People with fair skin are at higher risk of developing skin cancer and should take care to avoid over-exposure to the sun's rays. "If people are concerned about their vitamin D levels, they should see their doctor who may recommend a vitamin D test." She said it was too soon to start recommending supplements, but said most people could safely take 10 micrograms a day of vitamin D without any side-effects.